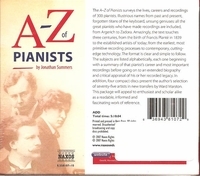 "This is no ordinary CD annotation, but a CD-size 862-page book boxed alongside a four-disc set of important and mostly rare piano recordings. Summers’ brief extends to an amazing 300 biographies [containing] a thumbnail review of each career and a short list of selected recordings, particularly valuable with those many artists whose records are nowadays almost forgotten….The transfers by Ward Marston are first-rate; as historical anthologies go, this has to be among the best-planned and the best-annotated. No piano buff…can possibly afford to be without it." 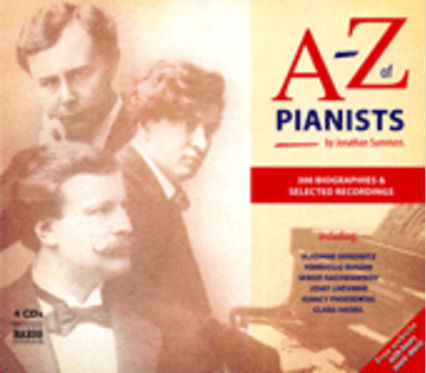 "The A-Z of Pianists surveys the lives, careers and recordings of 300 pianists. Illustrious names from past and present, forgotten titans of the keyboard, unsung geniuses: all the great pianists who have made recordings are included, from Argerich to Zadora. Amazingly, the text spans three centuries, from the birth of Francis Planté in 1839 to the established artists of today; from the earliest, most primitive recording processes to contemporary, cutting-edge technology. The format is clear and simple to follow. The subjects are listed alphabetically, each one beginning with a summary of that pianist’s career and most important recordings before going on to an extended biography and critical appraisal of his or her recorded legacy. In addition, four compact discs present the author’s selection of seventy-five artists in new transfers by Ward Marston. This is a book which will appeal to enthusiast and scholar alike as a readable, informed and fascinating work of reference."